Printed c.1855 by Abraham Le Blond using George Baxter's patented Baxter Process. A view of the southern front of the Palace of Westminster. 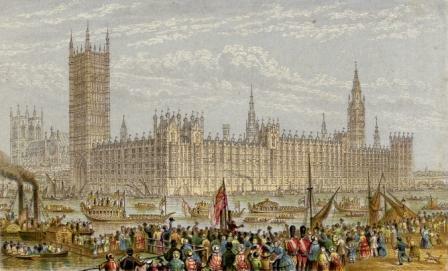 Probably the formal opening of The New Houses of Parliament by Queen Victoria in 1852 but certainly no later than 1856 as that was the last time the civic dignitaries took to the water. On the same plate as Her Majesty Opening Parliament, Her Majesty at Windsor and HRH Prince Albert in St. James's Park. All printed from 10 colour blocks. This subject and the other three on the same plate were also produced as chromolithographs, but when this was done and whether they were printed by Le Blond is unclear. Print size 11.5 x 7 cm. Le Blond number 17; Cl no. 57.